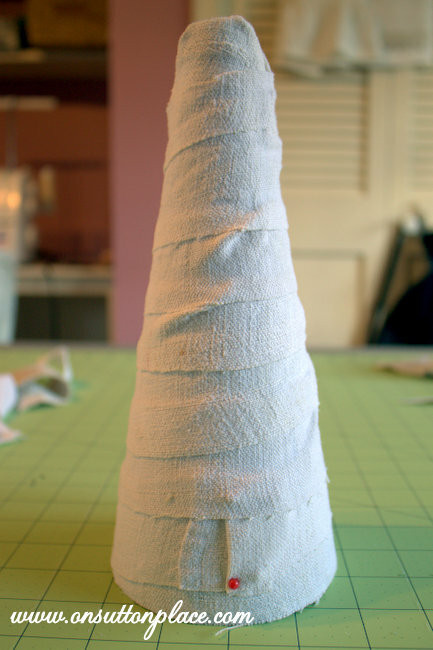 In this post: Grain Sack Christmas Tree How To. 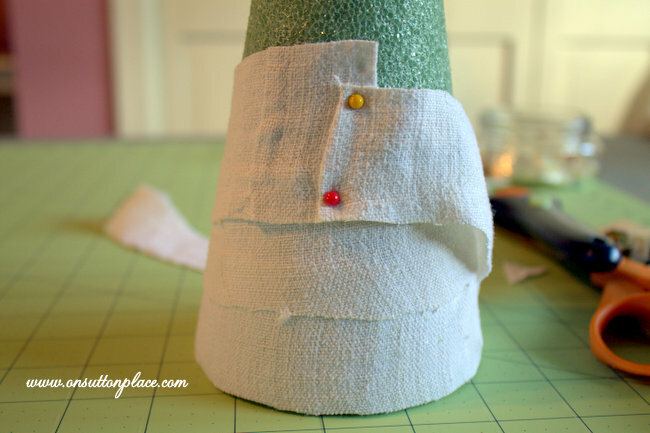 Easy tutorial with pictures to make a fabric covered tree. Use drop cloths, grain sacks or scrap fabric. Crafting is alway fun…but crafting at Christmas is the best. 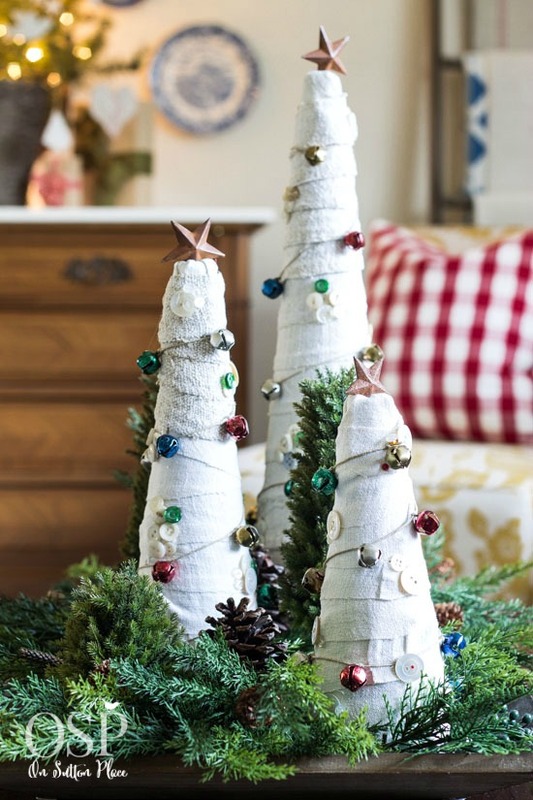 This grain sack Christmas tree project is one of my all-time favorites. I use these trees every year somewhere in my Christmas decor. Before we begin, let’s talk about the grain sack scraps. Obviously you don’t have to use grain sacks. I hate to waste even a scrap of grain sack and this is a great way to use up odds and ends. However, any type of fabric will work perfectly. Muslin, drop cloths, fat quarters, an old sheet. You need strips (length doesn’t matter) that are about 1-2 inches wide. Random is good. Fire up your glue gun so it’s nice and hot when you’re ready. 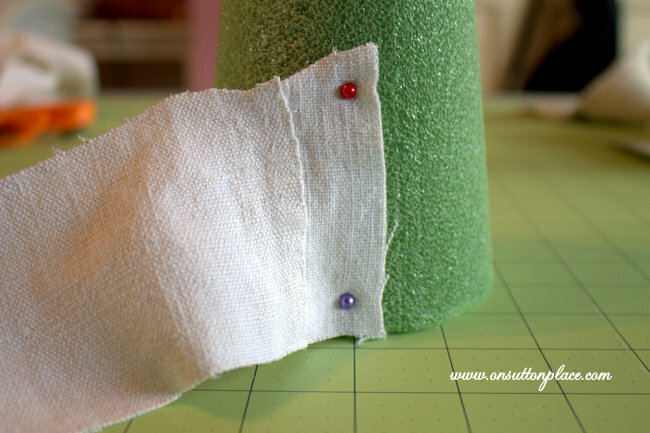 Begin at the bottom of the first tree and pin on a strip of fabric like pictured below. Don’t worry about the pin heads because you will be covering them up. Wrap the strip of fabric around the tree. You have to sort of pull it to make it go on smoothly. When you get to the end of a strip, overlap with another and pin where they meet. Continue up the tree until you reach the top. Make sure the top of the tree doesn’t peek out. Make the garland. I used vintage bells but you could use anything you have on hand. 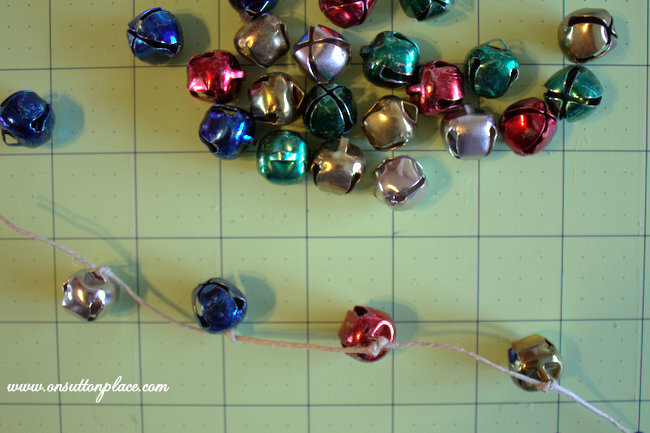 String the bells on thin twine. Decide now which side of your tree is the front. Start the garland on the back of the tree at the bottom, securing the knotted end with a pin. 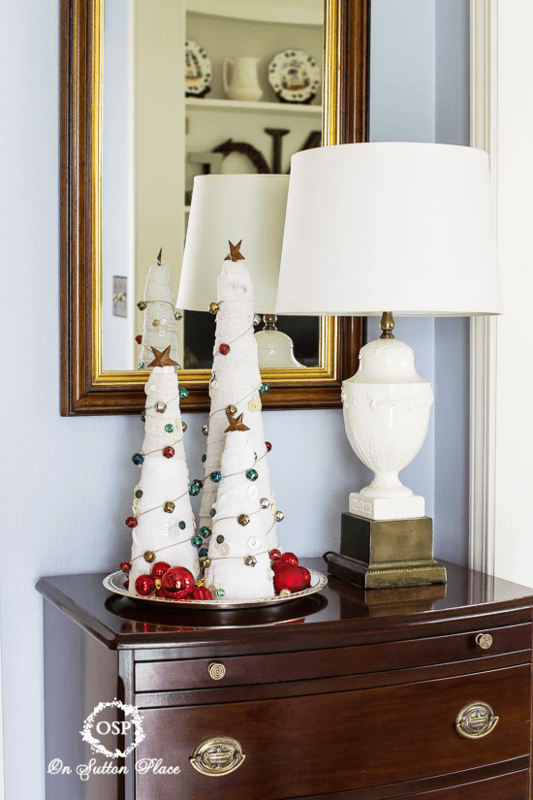 Wind the garland around the tree and secure at the top with another knot and pin. Glue on groups of buttons spaced evenly around the tree. Make sure and cover any pin heads with a couple of buttons. Attach your star to the top. There you have it. Finished. 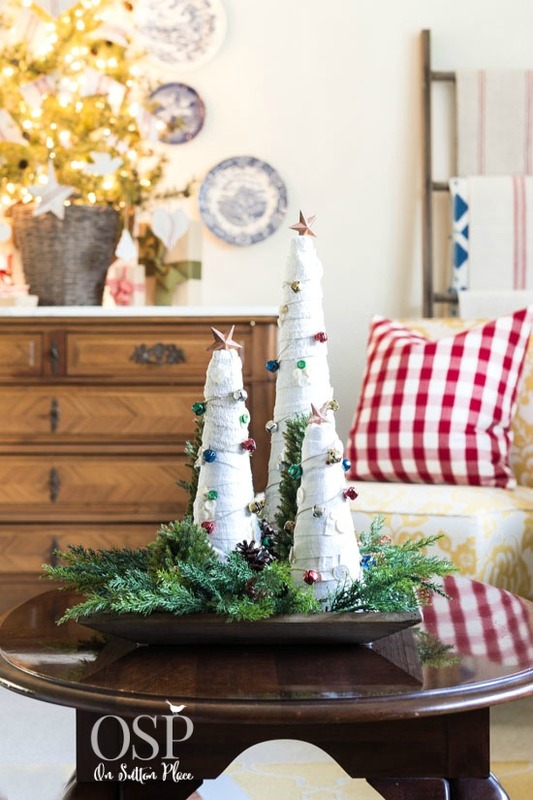 2016 Update: I made this grain sack Christmas tree set four years ago and have used them in my Christmas decor every year. I store them, wrapped in tissue paper, in a plastic bin. They have held up perfectly and are, of all the Christmas decorations I’ve ever had, my favorites. 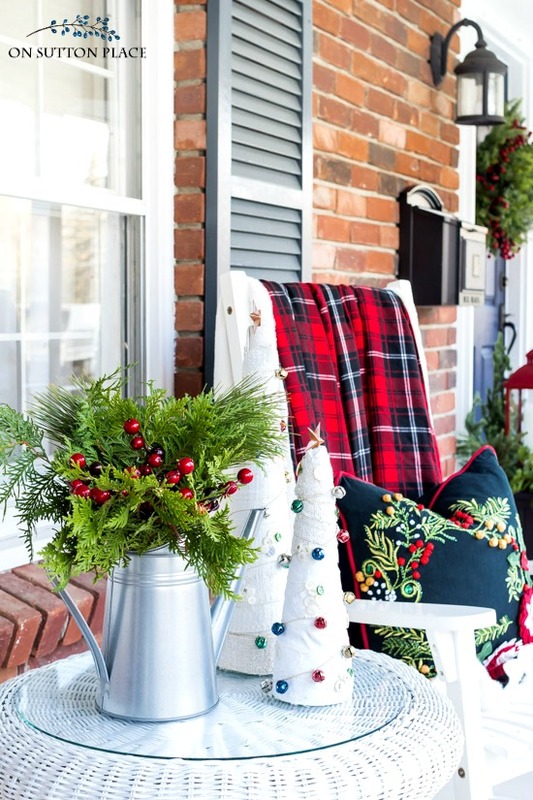 Click these links for more Christmas inspiration! This is a great idea. Thanks so much for sharing. I will have to pin this and do it next year! I have that three tiered basket, too! I have it in my craft room. I should use it in other places in the house!! Great tutorial! I have lots of fat quarters that I think would be adorable for this project. I could even see this as fall decor with a beautiful plaid homespun fabric and stringing acorns on the twine…oh the possibilities! Thanks for the inspiration! Beautiful Ann, you’ve done a lovely job! Love, Love, Love Ann! I’m just enamored with your stuff lately-giving hubby a big wishlist for Xmas! Dear Ann, your mini trees are so cute with their darling colorful button ornaments. I’m lovin’ that tiered basket…where can I pick one up? Hope your Etsy sales are going good and that you have much success with your growing business in the new year! Hi Ann, I love your grain sack trees! They look perfect on your table with your other holiday items. So simple and yet striking. I’ve never heard of fat quarters. Can you tell me what type of material is that? And to think, no mummies were harmed in the making of these trees! But, seriously, Ann, they are so pretty! 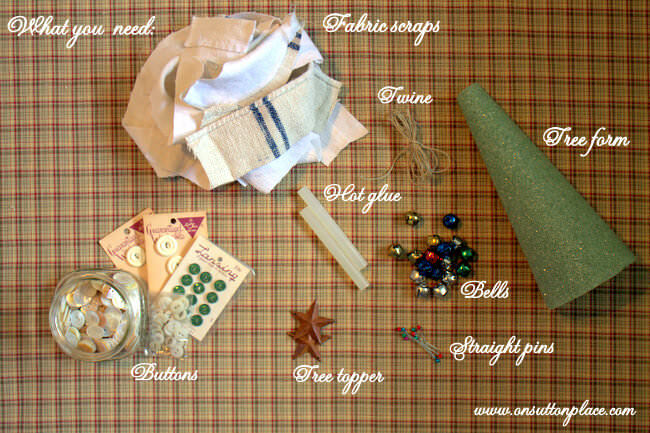 I’m thinking that is exactly what I need to make with my scraps from my stockings! You’re so incredibly talented and I smile every time I visit! really pretty! !1 Love the way they fit in with your home’s decor! Hi Ann, I love the look of your blog! I am now following you on on your social media sites! Great to meet a fellow, Ohioan, Etsy shop owner and blogger! Love them and certainly going to try this! Have a wonderful weekend! Love that organic look, Ann. Nice tutorial. Great tutorial ! Easy Peazy ! Thanks for the tutorial. You made it look so easy. I just love how they look! So cute. You may have started a new trend! How cute Ann!! These would be darling with any kind of scraps. Thanks for sharing. I love your cloth strip trees. And, your over-all grouping is very nice. This may be my next type of tree to make. What great trees. So cute and looks simple to do. Ann, these are such creative and delightful little trees! Isn’t it great when you can use scrap fabric!!! LOVE the bright “garland”! You are really so creative!!! They would also make a lovely gift! Your trees are adorable! And simple I can do… love how you use remnants of grain sacks. Fabulous tutorial and what a good idea! Thank you, dear Ann, I will pin that and perhaps I can do it next year. I’m done, energy wise and otherwise for this year. Very cute and would make use of some of the quilting scraps that I am accumulating! Thanks as always for your wonderful, beautiful and very useful posts.